The Neo-Pure MB-45200-25 is a High Efficiency 75/25 Polypropylene Sediment Depth Filter, which is a reliable and economical solution for pre-filtration in many applications. The 75/25 sediment depth filter, like FCRO cartridges, offer greater surface area for longer life and greater dirt holding capacity. 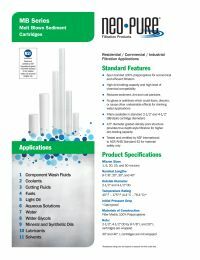 Neo-Pure MB-45200-25 filters are listed for food contact applications in Title 21 of the U.S. Code of Federal Regulations. 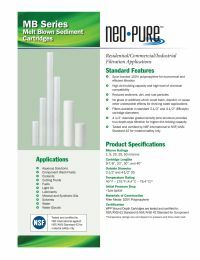 NSF Certified Manufactured for the Neo-Pure line by NeoLogic, The Neo-Pure MB-45200-25 Polypropylene Sediment Filter has been certified to NSF/ANSI Standard 42 requirements. Contaminant Reduction The filter reduces extra-fine dirt, sand, sediment, silt, rust particles, and scale particles. It has three times the dirt-holding capacity of similar sized sediment water filter cartridges. Typical Applications The MB-45200-25 Filter is ideal for all residential, rural, commercial, industrial, and municipal applications. Compatible Replacement Compatible with American Plumber, Aqua-Pure, Culligan, Pentek, Ametek and other 20" Big Blue Housings.